Health Mate Sauna's exclusive M-type far infrared heaters radiate this far infrared to safely and effectively warm your body. Because infrared rays penetrate the body over 1-1/2 inches throughout conversion, there is a deep heating effect in the muscle tissues and internal organs without giving too much burden to our heart. Our body reacts to the increased heating through the natural cooling process of perspiring. Through the perspiration process, acid and waste residue like toxins, sodium, alcohol, nicotine, cholesterol and the potentially carcinogenic heavy metals are removed from the cells (especially zinc, lead, nickel, cadmium, etc). As well as the pores of our skin opening and discharging waste products , the skin sheds any old skin cells , leaving it glowing and immaculately clean, with improved tone, elasticity, texture and colour. The deep penetrating heat also stimulates the heart to send more blood to the body cells to increase blood circulation, which improves many symptoms. Over the last 25 years, Japanese and Chinese researchers and clinicians have completed extensive research on infrared treatments and report many provocative findings. In Japan , there is an "infrared society" composed of medical doctors and physical therapists dedicated to further infrared research. Their findings support the health benefits of infrared therapy as a method of healing. While the moisture on the surface of the skin evaporates and thus cools the body, a number of other changes occur in the body to release the heat as quickly as possible. The heart beats harder and faster, pumping more blood through the dilated blood vessels , thus achieving the conditioning benefits of continuous exercise. As our body expends energy to produce sweat ( 1 gm sweat requires 0.586 kcal) a moderately conditioned person can easily sweat off up to 1000gms or more in a sauna session - the equivalent to running 10-15 kms. While this weight loss can be regained by re-hydration with water, the calories consumed will not. This is a valuable system for those who don't exercise and those who can not exercise, yet want an effective weight control and fitness program , along with the benefits that regular exercise bring. 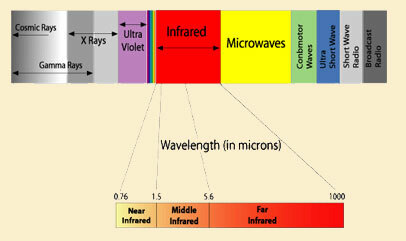 Because infrared is part of the sunlight, it's completely safe to use. Health professionals have used red infrared heat lamps for decades to treat muscle and joint problems. In hospital baby care units, incubators are often equipped with infrared heating systems to keep newborn babies warm. Whereas conventional saunas transfer heat by circulating hot air, thereby warming your body from your head down, the far infrared heat rays warm your body directly. This allows an in-depth heat in a more pleasant temperature of 110- 150°F (43 - 66°C ) , thus providing more health benefits and a highly enjoyable and comfortable environment.